The building work on West Offices is finished (outside, fitting out the inside will take a little longer). These photos were taken from the city walls in late November. The view towards York Minster is one of the most photographed and familiar views, from the wall walk beginning at Micklegate Bar. The new building is certainly striking, and dominant. 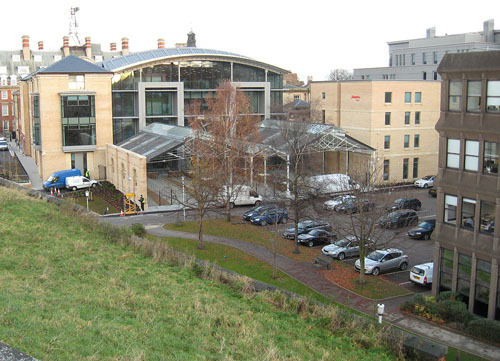 This, of course, is the City of York Council’s new headquarters, and it definitely says confidently ‘21st century town hall’. Within it the surviving parts of the city’s first proper railway station – the one built in the 1840s which, within a decade or two, was found to be inadequate. Let’s hope this isn’t the case this time. Again, those of us with family connections to York’s railway history may feel a little sad. After its time as the railway station it was railway offices. My dad worked here. It’s not that long ago that it was the workplace of many railway staff, as was the building opposite, the fancy one in red brick with stone details. Some years back that became a hotel, and now the transformation of the area is complete. The red brick railway offices used to be the most dominant building, now the council HQ is, confidently striding into the foreground, all big and bright. In the view above York Minster looks like a mousy little thing in the background. 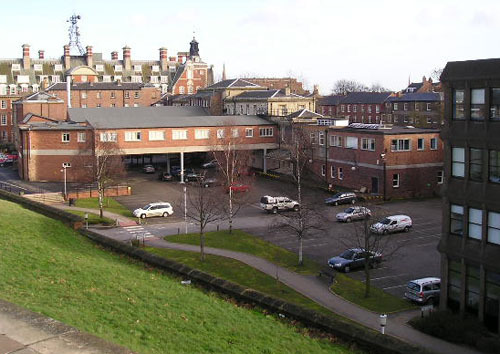 Alongside the new HQ on the far side, on Tanner Row/Toft Green, is the new hotel shown to the right of this photo. From Tanner Row it looked hideous and forbidding: it shows its best side to the city walls. 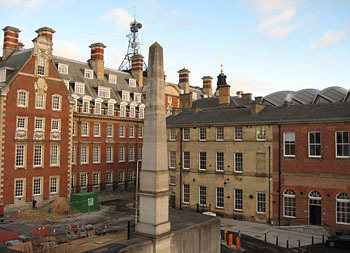 The lower part of the HQ building, in the foreground, is a large bike shed, incorporating some of the iron columns from the station buildings originally on the site. 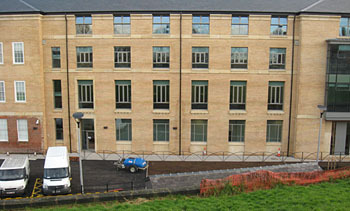 Moving round a bit, this is the new part of the HQ building facing the walls, with the original station/West Offices part off to the left. Moving along a little further, this view of the railway memorial and the two ‘railway offices’ looks very similar to before, apart from the higher modern roof on West Offices to the right. The paving has been replaced around the development, and when I visited the repaving was continuing along Station Rise in front of the war memorial. In case anyone’s struggling to remember how it looked before, here’s one I took earlier. 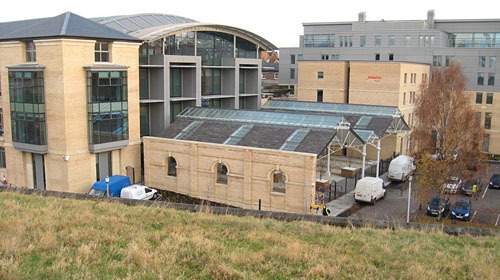 February 2004: Hudson House to the right, with the rather small-scale West Offices, all rather ‘unplanned’ looking, with bits added on over the years, including a modern addition which bridges the space where the railway lines once were. I hope these are of interest to readers who no longer live in York but who like to keep up with developments. This is probably the most dramatic one I’ve seen recently. The ‘before’ and ‘after’ isn’t the only contrast I’m thinking of, while making this page. The other is between the lavish refurbishment of parts of our railway heritage, up here on Station Rise, while down the road out of town demolition of another part of it is taking place with barely anyone noticing. These railway buildings within the walls are worth so much, the ones down Leeman Road worth nothing.